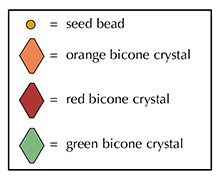 NOTE: I used orange, red and green bicone crystal beads but any size 4mm beads in any color will work just great. Step 1: Thread your needle with 4 yards Nymo, C-Lon or Fireline (or start with a length that you feel comfortable with and add more later). String an orange crystal, a seed bead, a green crystal, a seed bead, a red crystal, a seed bead, a green crystal and a seed bead. Step 3: String a green crystal, a seed bead, an orange crystal, a seed bead, a red crystal, a seed bead and an orange crystal. Step 9: String five seed beads. Step 11: String a green crystal, a seed bead, an orange crystal and a seed bead. Step 13: String an orange crystal, a seed bead, a red crystal and a seed bead. 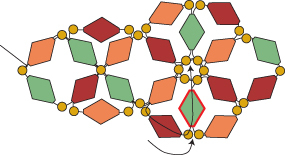 Step 15: String a red crystal, a seed bead, a red crystal, a seed bead, a green crystal and a seed bead. Step 17: String a green crystal, a seed bead, an orange crystal and a seed bead. Step 21: String a green crystal, a seed bead, an orange crystal, a seed bead, a red crystal, a seed bead and an orange crystal. Step 23: String a seed bead, an orange crystal and a seed bead. Step 24: String a seed bead, a red crystal and a seed bead. Repeat Steps 9 to 25 until your bracelet is the length you want it, minus about a quarter-inch and the length of your clasp. Step 26: To attach one end of the clasp, string three seed beads. 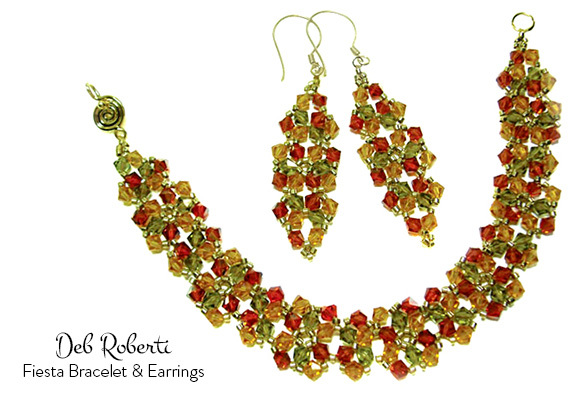 Go back around through the seed beads and the clasp several times to reinforce your attachment to the clasp. To attach the clasp to the other end of the bracelet, simply thread your needle with the tail thread from Step 1, go through the seed bead next to the knot and repeat Steps 26 and 27. 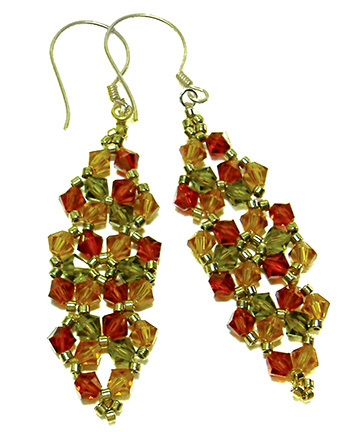 To make the matching earrings, repeat Steps 1 to 25 but start with just a yard of thread and leave a 6-inch tail. Next, just attach the earring (via the closed jump ring) to your earring post or wire. To finish the bottom of the earring, thread your needle with the tail thread from Step 1. Weave your way back into the earring. Knot in several places and then cut your thread.